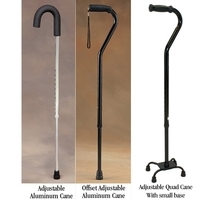 Lightweight, balanced canes ensure stability. Canes are made of high-quality, anodized aluminum with a foam-covered handle for a comfortable secure grip. The Adjustable Aluminum Cane provides comfortable, secure support. Cane weighs just 3/4 lb. (.34kg). Easy push-button height adjusts quickly from 30" to 38" (76 to 97cm) in 1" (2.5cm) increments. Supports up to 250 lbs. (113kg). The Adjustable Quad Cane features an offset handle and four-point base for better balance and stability. Height adjusts easily from 29" to 38" (74 to 97cm) in 1" (2.5cm) increments. Adjusts without tools for left- or right-hand use. Two four-point bases are available. Wide Base model measures 7" x 11" (18 x 28cm) and weighs 2-1/2 lbs. (1.1kg). Small Base model measures 5" x 7" (13 x 18cm) and weighs 2-3/16 lbs. (1.0kg). Both wide and small based models support up to 300 lbs. (136kg). The Offset Adjustable Aluminum Cane is balanced to help ensure stability. American Pharma Wholesale, Your Health Care Place.